The concept of using Trailer operation in Blackpool was not a new one when discussed in 1957. Back at the formation of both the Blackpool Corporation Tramway and the Fleetwood Tramroad, trailer operation was used early on however was quickly abandoned as being unpractical and time consuming to turn around at the terminus. Joseph Franklin, the head of Blackpool Corporation Transport, was interested in re-introducing trailer operation to allow for more high capacity trams that could easily have their trailers dropped off when not required. He went to Germany to look at trailer operation in some towns and cities there. Following the visit, series 2 railcoaches were admitted to the works, 275 and 276 would lose their distinctive pointed cab ends, which were replaced with flat ends to allow coupling to take place. 276 retained all it's electrical equipment, whilst 275 had its electrical equipment removed and became a trailer for 275. The new twin set was demonstrated to the Mayor of Blackpool during 1958 by transporting him from North Pier to Little Bispham and back again. The experiment was deemed a success and 10 trailers were ordered from Met Camm. Whilst a further 8 railcoaches and also 275 were converted to operate as motor sets. However, a number of flaws in the planned operation of these sets were discovered early on. The main cause of this being that driving equipment was only located in the railcoach, this meant that it was only possible for each set to run 'loop the loop' journeys and were limited to using the Starr Gate and Pleasure Beach loops in the southern end of the system and Little Bispham and Fleetwood Loops in the northern system thus resulting in alot of dead milage i.e. each set had to travel up to Little Bispham first before being able to head south and each set had to travel at least as far as Little Bispham before heading south to depot. It was also planned for the trailers to be dropped off at quiet times but there were operational difficulties and some costly solutions which would have been needed to allow this to happen. Firstly, there was nowhere convienient to leave the trailers, they would have had to have been left on the centre tracks at Tower, North Pier, Cabin, Bispham and Thornton Gate or the short siding at Pleasure beach or the loop at Fleetwood ferry. This then would mean that there was less capacity for turning trams and for waiting there during meal breaks. The Trailers would have required hand brakes to be fitted to stop them from rolling away on gradients, trailers would also have needed to be fitted locks to keep the public out when they were stored here. A costly solution to number one would be to build storage loops on the prom but that would have required a remodel of the track and points to be fitted as well as crossovers. The only other option which did happen was for the motor and trailer to return to depot and the trailer being shunted into an empty pit, this was seen as time consuming as this meant that the crew off the twin set were off the prom and shunting the trailer around whilst they could be on the prom on a tram carrying passengers. The most simple and effective solution to this problem was found and in the late 60's 7 sets were permanently coupled together with a set of the driving equipment relocated to the trailer allowing driving from either end which allowed reversing to take place. 677 and 687 were the last set to be coupled permanently, being done in 1970. The trams were renumbered from 281, 272-280 to 671-680 for the motor coaches and T1-T10 were renumbered 681-690 in 1968. The remaining 3 twin car motors which weren't permanently coupled up, were rarely seen with their trailers after 1970 and were often used as ordinary railcoaches. This situation became permanent from 1972, when trailers 688-690 were withdrawn and either sold or scrapped. The 7 permanently coupled sets were rarely used outwith the peak time of the season, which was between June and October. Use was limited to busy times such as market days and during the Illuminations. The twin sets were repainted into half green, half cream livery during the 1970's and would retain this same livery (and in some cases, the same coat of paint!) until the 1990's. The Twin Cars received very little works attention during this time. 675 had its roof windows paneled over on the outside of the tram with new plastic paneling covering the space where those windows were on the inside. This work was done in 1975 and was the only twin car vehicle to receive this work. The motor cars were fitted with pantographs during the early 1990's, thus making reversing easier as there wasnt a trolley pole to get turned any more. trailer 681 had to have its cab end rebuilt in 1999 following a collision with another tram during the previous year that crushed the cab. The twin car had its moment in the spotlight during 2002 and 2003 when all double deckers were banned from travelling North of Thornton Gate due to the track being in poor condition. Faced with a dilemma of how to deal with large crowds heading to Fleetwood on Market days at one of the busiest times of the year without most of their highest capacity trams, the staff at Blackpool Transport decided to operate the Fleetwood service using as many Twin cars as possible on as many routes as possible. On the day the ban came into operation, brush cars operated the timetable whilst the twin cars were all prepared for their stint on the timetabled service. The following day, all 7 sets operated on 7 out of the 9 routes on the Fleetwood service. This was the first and the last time that all 7 sets operated on the timetabled service at the same time. The twin cars went on to operate many of the journeys between Starr Gate and Fleetwood during the remainder of the 2002 illuminations and the 2003 summer season. Over the winter of 2002-03, 671+681 and 672+682 were taken into the works and had heaters fitted to both the motor and trailer cars, their seat cushions replaced and were repainted into Line 2 and Line 1 Metro liveries respectively. The third repaint, which wasn't completed in time for Easter was for 674+684, which was to be repainted into Line 4 livery. The tram was required for service over the Easter weekend and was pressed into service in new undercoated panels and had been rubbed down ready for painting. The repaint was completed by May 2003. 673+683 and 675+685 were also repainted in Autumn 2003 and Autumn 2004 respectively. A minimum of 4 twin cars were required for timetabled service daily over Summer 2003. The double decker ban north of Thornton Gate was lifted by Easter 2004 following extensive track relaying, meaning normality could return, however the twin cars continued to operate on the Starr Gate to Fleetwood route when there was a shortage of suitable trams, but this was rare as double deckers were preferred. One of the downfalls of using the twincars on the Fleetwood service was that they were slow loaders due to passengers not being able to decide what door to use and which carriage to sit in, resulting in the trams running late and occasionally having to turn short of their destination. 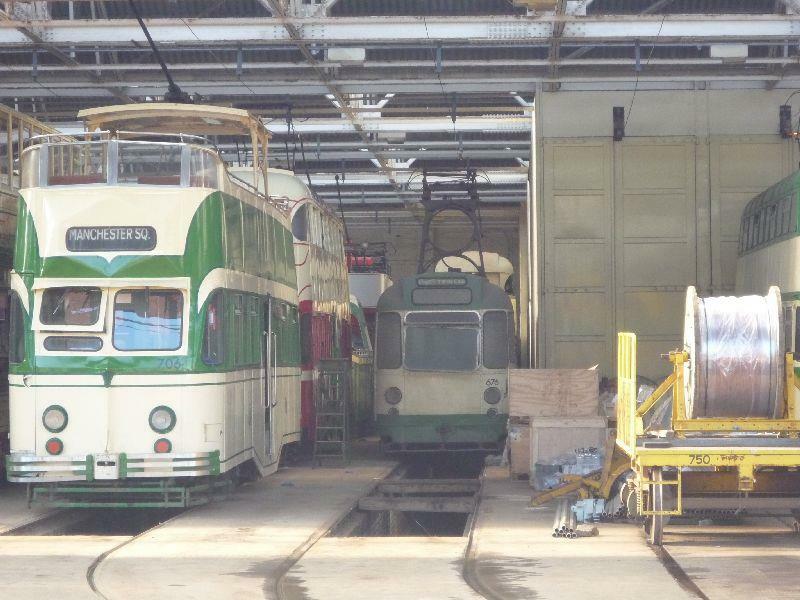 Following the mass withdrawal of trams at the end of the 2004 season, unrefurbished Sets 676+686 and 677+687 were both withdrawn and stored for possible further use. in June 2007, 677 was scrapped (apart from a section from the underframe and a section of the body framework) to provide a replacement body section for the restoration of the Western Train. 687 became a store for spare parts for the Western train and also for parts salvaged from 677. In 2009, set 671+681 was withdrawn as surplus to requirements as was 674+684 which were suffering from problems with the coupling between the sets. During the 2010 season, sets 672+682 and 675+685 both found regular use on the Pleasure Beach - Thornton Gate intermediate service. Also as a number of trams had been sold and / or had departed the tramway, 671+681 and 673+683 returned to service for the illuminations period although were limited to journeys as far as Bispham before being withdrawn in November. With the end of the traditional system in 2011, it looked to be the swansong for the twincars, with both 672+682 and 675+685 seeing use on farewell tours on the last day of service, with 672+682 also replacing 711 which had suffered a fault for its last journey. A proposed move to Crich fell through for 672+682 and it was retained for the heritage fleet and repainted into original all over cream livery and received the original pre 1968 numbers of 272 + T2. 675+685 returned to use in September 2015 in 70's Green and Cream livery whilst 676+686 have retained for future use and 671 and 681 have recently returned to Blackpool . 673+683 and 687 are in outside store at Fleetwood Docks, whilst 674+684 are at the North East Land Sea and Air Museum in Sunderland.